In a reaction Vijay Kumar raises further and more detailed questions which I am happy to answer in this article. This question touches on the whole mystery of how spirituality and ritual developed in ancient India. There are only a few things we know for sure. The Vedic tradition goes back very far in time. When and how the other form of ritual, Puja (worship) as performed in temple and at home, usually named Agamic, developed, is far from sure. Academic research holds on to a date of after 1200 BC for the Vedic tradition and after 500 AD for the Agamic tradition, based on textual considerations. 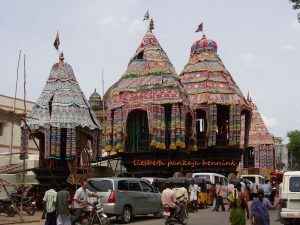 The utsava is a temple festival, so there would have been temples. Temple building is usually referred to as starting from the cave temples, through to the structural temples. But there is enough literary and archaeological evidence that brick temples existed long before the advent of the stone temples. Personally I feel that both these movements are not contrary but rather complementary. Proving this is another matter. And what happened before the texts were composed? Vijay Kumar: 2. i hv not seen an temple grant describing gift of any material for kovil theru / making / plating etc . if you hv come across do let me know. I have not studied the inscriptions directly, but know of them mostly as they are used in historical studies related to specific subjects such as dance or governance. I could not answer this question therefore. Vijay Kumar: 3. does any agama / temple contruction text speak of kovil ther contruction … i see some ref to ther muttu – but that comes in forts. others talk of ther adi ….but no direct ref. Probably the best direct reference is Aghorasiva’s Mahotsavavidhi, translated by Richard Davis as “A Priest’s Guide for the Great Festival” (2010). 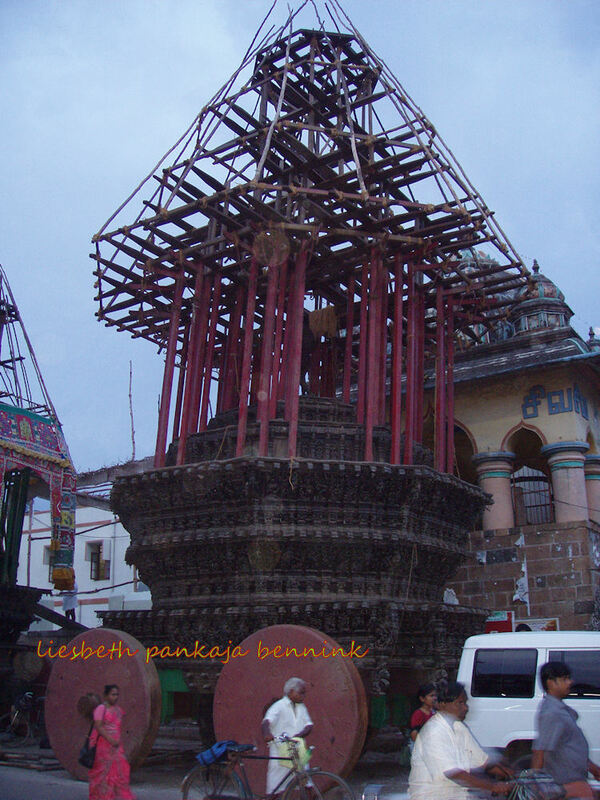 Dated to 1157 it treats of all aspects of the Mahotsava from the perspective of the Saivasiddhanta. In both the 9 day festival and the 13 day festival the Ratha is scheduled for the 7th day. In a note on page 125 the author Davis informs us that instructions for the construction of the temple chariot can be found in the Mayamata (chapter 31), Manasara (chapter 43), and the Kamikagama (Uttarakamigamana chapter 71). The wealth of detail indicates a tradition that could easily be thousands of years old. I would love to dive into all these riddles and questions. For me I believe the key to the festivals can be found in astro-archaeology. Of course I am happy to consider and discus all options and contributions. We should ask the people who make these, the architects, sthapatis. Vijay Kumar: the height, solid construction, huge wheels… why make something that is so cumbersome to move – obviously it could not be pulled by yoked animals – meaning it couldnt go fast. why put the deity at such a large height, even though you could say it gives everyone a view to the deity – the utsavars are normally pint sized versions of the mulavars. 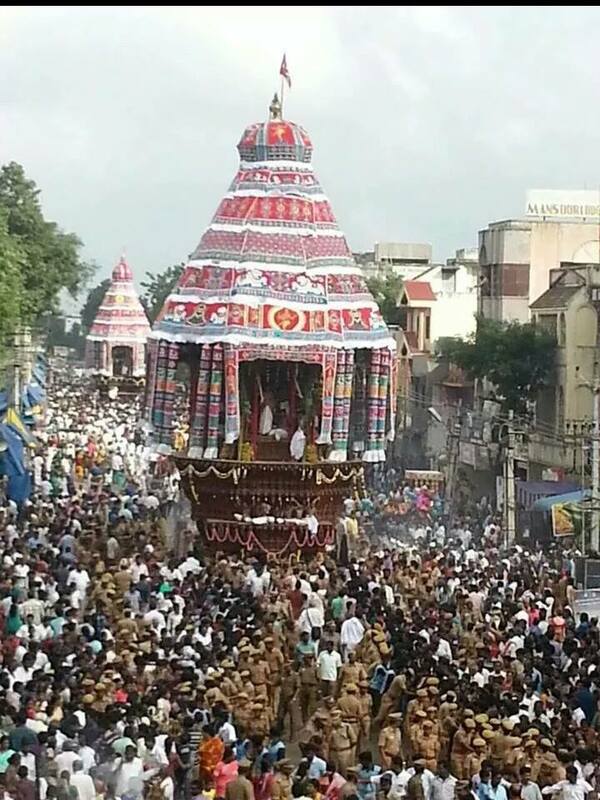 With all the decorations you would be lucky to get a glance of the god on top of some of the larger the’rs. Good questions of course. But can we be sure the chariots were always large constructions? Temples, gopurams, they have all grown over time, as people added structures and build larger ones. We find many smaller chariots, now often standing abandoned, with the smaller temples. I think the mystery has to be addressed holistically. 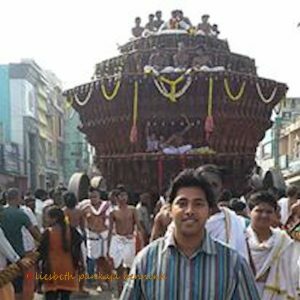 The concept of Nitya Puja, Utsava, and temple construction and ritual is a holistic entity. Puja, worship, is conveying the same meaning through Time (4th dimension) which temple architecture is conveying in the first three dimensions of width, length and height. Now these elements are studied by many as though they have no connection to one another. And sometimes interpreted as political or social/political constructs. We all instinctively recognize the beauty of the edifices, the murti’s, the ritual. What does this tell us? But then there is the attempt to interpreted it as a functional development. The Nataraja was a propaganda instrument of the territorial ambitions of the Chola dynasty? And so was the Tripurasamharamurti? And the temple chariot is a development from ancient siege machines? If it is so, from where derives the basically instable shape of the inverted pyramid? If you design something to break through city walls it has to be heavier and stable from the bottom-up. As can be seen from the drawings and reconstructions. 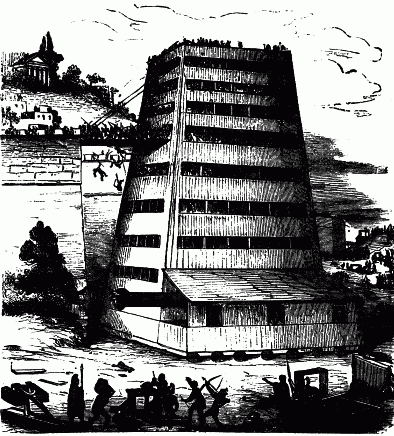 The temple ter is always an inverted pyramid. If it wasn’t for the base with the four wheels it would definitely topple. I can only state what I stated in my previous article , that the pyramid shape refers to Meru as the World Axis, the Skambha. The war engines are always heavier and broader at the bottom then at the top, as necessitated by the purpose for which they were constructed. What can be concluded from the shape of the temple chariot as an inverted pyramid? All temple construction and ritual has a cosmological element. Always the chapter on cosmology is an important element in Agama. One of the four main subjects that constitute an Agama. And from what I have read those studying agama often are confused by this. The emphasis on cosmology sometimes seems out of place to them. But I think cosmology, and the conveyance of cosmological knowledge to both educated and lay people is the essence behind temple construction and ritual. As my late guru Raja Deekshithar said in his book “Chidambaram, The Hidden Treasure in the City of Ether”, as a visual yoga. Is there any historical evidence that ancient Indian cities of the medieval period and earlier experienced the type of sieges that generated the siege machines known from antiquity and the middle ages in West Asia and Europe? Do we have historical material, or mythological? I am sure VJ Kumar is knowledgeable about the inscriptions as not referring to the construction of Ter, but what about references on this kind of war technology? I have read of Indian war craft, the horses, the elephants, the chariots and how they were applied in battles. I haven’t come across sieges of cities. I have come across the forts, on hill tops mostly, where siege machine would be useless. And even though temples usually have ramparts, and have sometimes been used as forts in the historical period, I have not come across descriptions of the type of long term sieges that would necessitate siege machines. The great Indian cities like Vijayanagara or Delhi had extensive ramparts, as I could see from my plane as I landed at Delhi airport recently? But did ancient Madurai during the sangam age? And were there ever sieges that applied this kind of militairy technology? 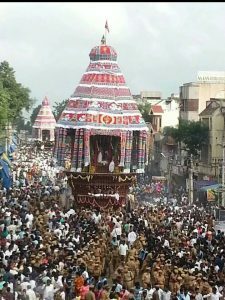 Tanjore had, but that is relatively recent, and from the Mahostsavaviddhi we can be sure all elements for the utsava, including the Ratha/Ter/chariot processions were in place by the 12th century. Were these great cities ever attacked in this kind of mechanical fashion? And if they were, can any link be made between this war technology and Agamic ritualism? Warfare was an important study subject in India. What do the texts say on the subject? There are obvious many questions about temple construction and ritual that await answering. And I am not going to say I have all the answers. And what does this say about the whole subject? Why has this knowledge been lost? We all feel something great is there, but a mist seems to have been drawn over it. The power of it is great. It has inspired countless people to immeasurable, anonymous, and in our time unsurpassed, brilliance. As I see these wonderful creations of these ancient artists, architects, priests, officials and kings I can only feel small and insignificant and stupid. Trying to say something about them, with almost no knowledge or understanding. We are failing them, because we are unable to hear and see what they are saying with such incredible eloquence. This article was originally posted as a note on my Facebook account.